A few days ago there were whispers on the winds that “The Last Station” had been picked up by a specialty division with a number of art house releases primed for the season. All signs pointed to Sony Pictures Classics. Today we get a confirmation (and I’ve independently verified) that, indeed, the film is a new awards hopeful in the Sony Classics stable. This has been the natural fit, in my view, since I saw the film at Telluride. 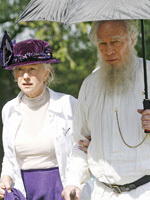 So, expect lead acting campaigns for Christopher Plummer and Helen Mirren, the latter being a definite possibility. Also, I’m sure supporting campaigns for James McAvoy and Paul Giamatti will be in store, odds on the former more than the latter. And cngrats to Michael Hoffman for finding a home for his film, a tight, warm, well-made piece of work that deserves a look if only to see these wonderful actors working off of one another. Thge film will hit theaters in limited release on December 23. Yay. I really am looking forward to this. Streep & Hopkins originally had the lead roles in this film. So Streep and Mirren may go head to head again. the film will be released next December 23 on limited release, and the expansion will be on February 5, 2010. I’ve been interested in this for some time, but didn’t expect it until next year. Woot, woot. I’ve gotta modify my predictions now. Plummer has a nice year it seems–will it finally pay-off in his long overdue nomination? Either way, I’m rooting for McAvoy to fill one of those empty Supporting Actor slots. I’d think more voters are likely to rank him #1, 2, 3 over Baldwin, at least :P.
That’s great. Really looking forward to the film and performances. Rooting for McAvoy! How do Golden Globe and SAG nominations work if they are announced before TLS comes out? Are these possibilities for Mirren, Plummer and McAvoy if the movie isn’t widely released until after the awards shows? Nope, every year there are several films release after the nominations. It doesn’t mean a thing. Most films screen way in advance anyway for these awards committees. In 2005, I know that NBR, usually the first to release their awards and jump-start the season in early December, delayed their announcement until Munich was available to be screened. I believe Letters from Iwo Jima missed out, because it was back on the calendar at the very last minute. But that’s an exception. So no worries. They will almost certainly see The Last Station and take it into consideration. It’s no guarantee it actually gets noms, but still. Here’s hoping Supp. Actor is Waltz, Damon, Molina, Tucci, & McAvoy. What a line-up that would be! Remove Damon, add Sarsgaard, and that looks good to me =). Oh, movies are seen WELL in advance of release dates. Generally there’s an HFPA screening deadline sometime in late November, but usually by December, everything’s been seen. Actually, “Letters from Iwo Jima” won the NBR’s Best Picture prize, and figured in the Globes too. Oops, I should’ve specified: It missed out on the **Guilds**. My bad. Just like half of everything in 2007, albeit for something else entirely….